Growing up on Long Island, New York – and with a Sicilian grandfather – Italian cooking has been a big part of my history. And when it comes to pizza (especially New York-style pizza), I like to think that I know what the good stuff tastes like. What can I say? I have high standards. As much as I enjoyed ordering a great pie, I also enjoyed making one at home from scratch. It became a tradition for Kelli and me. Most often on Sunday nights, she’d make the dough, I’d make the sauce, and then we’d shape the pizza and cook it on a stone in our oven. 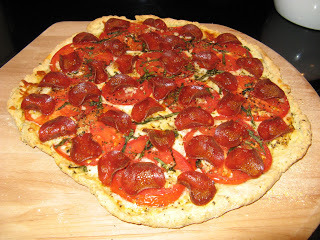 Naturally then, when we went gluten-free, one of the first things we wanted to do was try to make a GF pizza. It was early in our GF days, and the learning curve was still steep, so we figured the easiest thing to do would be to buy a pizza crust box mix and whip it up. As usual, Kelli pulled out the KitchenAid mixer and prepared the dough. “It’s ready for you to shape,” she called out. I walked over and peered into the bowl. What I saw had the look and consistency of cake frosting. “How am I supposed to shape that into a pizza crust?” I asked. It just felt wrong. But I followed the directions and what came out of the oven tasted…terrible. The crust puffed up to twice the thickness of a slice of Sicilian, had the texture of sponge cake, and a taste so bad Kelli couldn’t finish the first slice and I couldn’t finish my second. Since those early days we’ve perfected several pizza recipes, including this one, which uses the Chebe brand pizza dough mix. This recipe’s combination of fresh tomato, garlic and basil makes it pop with flavor. Enjoy! Prepare the Chebe pizza crust as per its instructions. Be sure to par-bake the crust. On the par-baked crust, layer the cheese first, then the tomato. Mix the garlic and olive oil in a small container and then spoon onto the pizza. Sprinkle with fresh basil, dried basil and dried oregano. Pop it in the oven and continue cooking until it’s done to your liking (we like our pepperoni well-done!). Hi Maureen! Par-baking means to partially bake the crust naked, without any toppings on it. Then you pull it out of the oven, top the pizza with the works, and put it back in the oven to finish the baking process. In our oven, we usually par-bake for 8-10 minutes, and I should also mention that we use a pizza stone, which transfers heat differently than a regular oven rack.